Forex Trading - How Do You Know When to Enter and Exit a Trade? Previously, we have discussed the forex market, how it operates and determines foreign exchange values, what types of information move the market, and the key factors for success for anyone contemplating trading in the forex markets as a career or investment pastime. Now we will cover the most important tool in a currency traders toolbox, Technical Analysis, and how it will guide your entries and exits in the Forex markets. Information related to money and risk management techniques will round out this discussion regarding the crafting of an effective step-by-step trading plan, a "must have" when dealing in this market. Whether you are day trading in forex or extending your trades over a few days, known as swing trading, the key to making profitable trades is tied to knowing when to optimally enter and exit a position. The swiftness of pricing movements can astound many newcomers to this market, leading to quick losses if you are not careful. Statistics for the industry show that losing trades outnumber winning trades 3 to 1. The message is clear, you must minimize your losses early, and let your winners run for as long as you can. You win in forex trading by increasing your net gains. Losses are a part of that equation. Technical analysis put quite simply is the study of previous price behavior of stocks, commodities or currencies in order to forecast their pricing movements in the future. 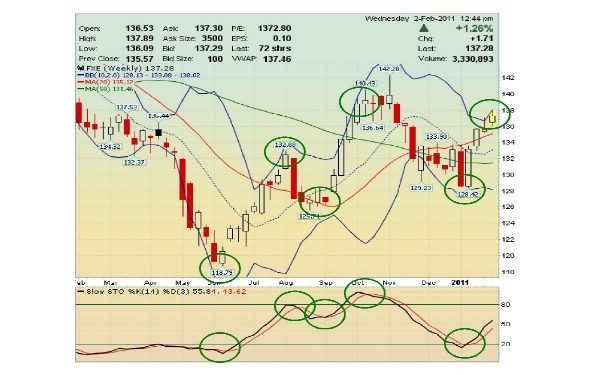 The study typically uses charting and pattern recognition, often derived from complex calculations and various formulas. Computer software programs do all of the work today. One great benefit of technical analysis is that it is flexible. The same principles apply across investment types and also timeframes. A day trader focused on forex scalping strategies might use similar, but different time period charts than a swing or position trader looking for trends that might last days or weeks. The chart above is for a longer-term currency trading, but the same tools would work on hourly charts as well. Slow Stochastic Indicator: Known as an oscillator, this indicator is favored by forex traders due to its sensitivity to signal overbought and oversold conditions. The green circles indicate signal points for entering and exiting the market. If the last position was closed, then the three trades would have produced a 32% return. Prudent risk management rules would have also set stop-loss orders below each entry point to protect you from adverse pricing movements. Money management rules would limit your position outlays to 2-3% on each Forex trade, and never more than three times that amount at risk at any one time. Trading Forex is high risk and complex, but hours of practice and a disciplined approach to the market are keys for success.